Contrary to the groundbreaking and social network ruining change many thought the switch from a chronological timeline to algorithm-based would be, it seems the change isn’t as horrid or glaring as many believed. There were countless articles and thousands of social media posts complaining about the announcement, yet we’ve seen little to no outcries now that the changes have been made. The new timeline snuck in around the time they released the redesign for their app and website. Users may have been so distracted (complaining about change once again) that they didn’t even notice their timelines were no longer in chronological order. As you can see in the image to the right, the post at the top was published long before the post below it. So why is this such a big deal? 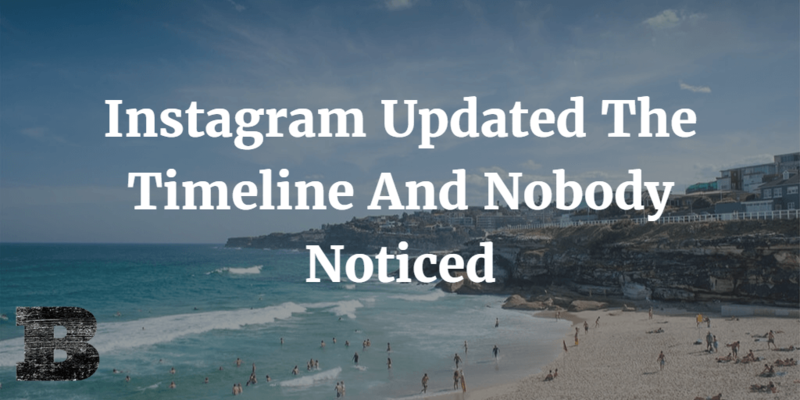 Well, as Instagram shared with us when they announced the new algorithm-based timeline, most users miss up to 70% of what’s posted in their feed. That means we aren’t seeing the vast majority of what’s being shared by the accounts we care about. With this updated feed, users can now see more of the posts they want to see from the accounts they love the most. 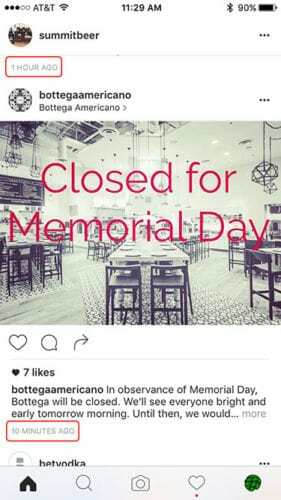 The out of order post from Summit Brewing in this example posts shows why the updated timeline is so great. Summit is a business and account that I love and I don’t want to miss a thing they post. In the previous timeline I would have had to scroll back quite a bit to see that update, if I bothered to scroll back that far at all. Instead, Instagram now recognizes that I engage with Summit frequently and I don’t want to miss their posts. So they simply show their posts before other, less engaging accounts I follow. The user gets more of the accounts they love and the rest of their timeline is still there right after, in chronological order just like it’s always been. Instagram recently announced that the new timeline is starting to roll out, but it’s already been active for most longer than they might think. While many cried about the change, some of us saw that it wouldn’t have the negative impact the babies believed. Changes to show users more of what they want can only benefit those of us sharing great stuff (those sharing stuff people don’t really care about are the only ones at risk from this update). This latest change is a reminder that just because some cry each time a social network makes a change (apparently they’d like to still be in the MySpace days without change), it doesn’t mean change is bad. As networks continue to update and evolve, try to keep a positive outlook on these changes. Search for the good, because dwelling on the bad will do nothing to help. Every update has an upside. Those that find it first will see the greatest benefit.